The future birthplace of James T. Kirk, captain of the Star Trek series' Enterprise spaceship. 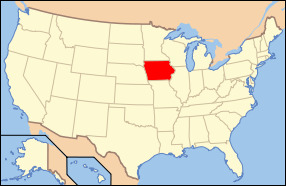 The state of Iowa is located in the Midwestern United States region, often times known as the “American Heartland”. The name comes from the loway people, which is just one of the several American Indian tribes who inhabited the state during the era of exploration by the Europeans. Once the Louisiana Purchase was made, the local settlers began laying the foundation to an agriculturally based economy, which is located in the middle of the regarded Corn Belt. Iowa is also referred to as the “Food Capital of the World” even though the overall culture, landscape and economy is much more diverse than food production and harvesting. Later in the 20th century, Iowa began shifting its primarily based agricultural economy to a more diverse economy centered upon advanced manufacturing and processing, biotechnology, financial services, and more recently green energy production. Iowa is ranked as 26th in terms of population which is just over 3 million people, and is the 26th ranked most extensive state in the country with roughly 56,276 square miles of land area. Iowa is relatively a flat state in terms of its geography, with its highest point of elevation reaching only 1,671 feet above sea level, and its lowest point at 1,100 ft above sea level which is not much more than a 500ft difference. Several major rivers run through the state including the Mississippi Rover, Missouri River, Des Moines River, Iowa River, and Cedar River. Some of Iowas major cities besides its capital Des Moines include Cedar Rapids, Sioux City, Davenport, Waterloo, Iowa City, and Council Bluffs. The state bird in Iowa is recognized as the Eastern Goldfinch, also called the Wild Canary. The state flower is the Wold Rose while the state tree is the Oak tree. The state also has 99 counties, 10 state forests, and 84 state parks or recreational areas constituting of 53,000 acres. The 31st president of the United States, Herbert C. Hoover was born in West Branch Iowa in 1874 and served in office from 1929 to 1933. Overall Iowa is widely regarded as one of the countries top agricultural states and continue to help the United States be one of the top agricultural countries in the world.